Christopher Brown and Elizabeth Black, joint owners of Your Neighborhood Christmas Tree Farm, are pleased to announce that we once again have 225 small seedling trees to give away this summer, starting Saturday June 15th at 7AM. The give-away will run until all the trees are gone. This is the 7th year of giving away trees. The free trees are 1 – 3 foot tall Russian hawthorns, Kentucky coffee trees, lindens, horse-chestnuts, choke cherries, ginnala maples, locusts, and catalpas. There are also some golden currants, lilacs and the aggressive North Boulder rose, which deer are afraid of. All trees are drought resistant, but of course will grow faster and fix more carbon with extra water. Please be sure to plant your trees right away, and take good care of them. It won’t help the climate at all if you plant a tree, and then kill it with neglect. After viewing “An Inconvenient Truth,” Al Gore’s movie, we decided we had to do something to combat global warming. 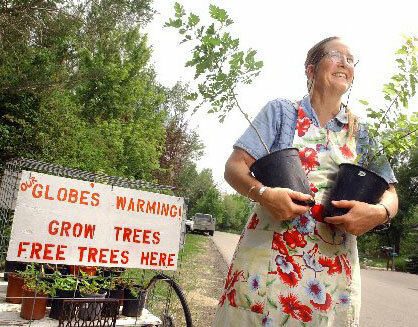 Growing trees to give away seemed like something we could do to help. Although growing trees fixes carbon and helps combat global warming, it is not a final solution to the problem. The tree eventually dies or is cut down, and burns or rots, returning carbon to the atmosphere. But planting trees does help buy us more time to find long term solutions, and can make your life much more pleasant.